SYNOPSIS: What was Mark Whitacre thinking? A rising star at agri-industry giant Archer Daniels Midland (ADM), Whitacre suddenly turns whistleblower. Even as he exposes his company's multi-national price-fixing conspiracy to the FBI, Whitacre envisions himself being hailed as a hero of the common man and handed a promotion. But before all that can happen, the FBI needs evidence, so Whitacre eagerly agrees to wear a wire and carry a hidden tape recorder in his briefcase, imagining himself as a kind of de facto secret agent. Unfortunately for the FBI, their lead witness hasn't been quite so forthcoming about helping himself to the corporate coffers. Whitacre's ever-changing account frustrates the agents and threatens the case against ADM as it becomes almost impossible to decipher what is real and what is the product of Whitacre's active imagination. Based on the true story of the highest-ranking corporate whistleblower in U.S. history. REVIEW: Finally! The highly anticipated missing tale of “double 0 14”, a.k.a. Mark Whitacre is here. He claims to be twice as smart as 007. Hmmm, not so sure about that but he does have a very strong talent that keeps the people around him as well as us, the viewers, dumbfounded. Steven Soderbergh is back directing another jewel and as usual his flare for the out-of-the-ordinary is prevalent. You will be confused and frustrated but you will also be amused and entertained. This movie is random, crazy, funny, and did I mention crazy. It does start out slow which is where most of the confusion comes about but then it starts to really pick up. Regardless, you will most probably reach a point where you’ll have no idea who or what to believe and let’s just leave it at that. I would say that the two strongest aspects of this film are the script and the acting. The script is intelligent and just complex enough to keep you on your toes as to what’s going on. The acting is excellent especially because we are dealing with humdrum characters that require good performances in order to keep you interested. Granted, the story and the scene-to-scene situations also do a good job of that and they also add plenty of humor. You won’t believe some of things that take place. Another interesting aspect of the movie is the music used throughout. It is corky and yet appropriate. Many times it also adds to the comedy of the moment. Mr. Soderbergh’s movies generally have carefully and appropriately selected music selections for its soundtrack and this one is close to the top of his movies in that regard. Mark Whitacre is quite a character, really. It is extremely difficult to read this guy. You can’t tell if he’s coming or going, so to speak. 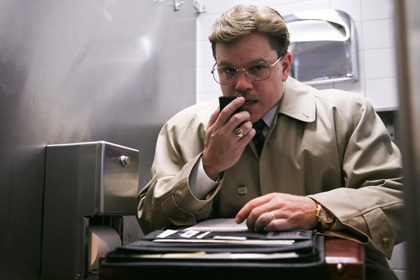 Matt Damon does a fantastic job with this role. He is just a boring company executive in the heart of the 90s doing his job and maintaining his family. Before he knows it, he is in the thick of this entire story and his life is turned upside down. Speaking of the 90s, the time frame for the bulk of this story is early to mid 90s and maybe I’m in denial of all the time that has passed since then but it looks more like the 70s to me. I don’t know, I think the 90s was like just the other day and this looks so old. Part of the randomness of this picture is in the form of thoughts narrated by Mark Whitacre (Matt Damon) that seem completely irrelevant, or are they? They also overlap and drown out many scenes of the movie where you would rather hear what’s actually happening in front of your eyes than to hear him ramble about some meaningless trivialities. Random and bizarre I tell you. It’s kind of hard to describe but you will know what I mean when you see it and try not to get too distracted by it although at times they are pretty funny. Overall, this is not Soderbergh’s best work, but it is truly unbelievable.